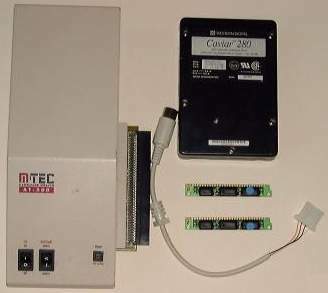 IDE Controller which connects to the side expansion slot of the A500. The unit can be expanded with 8MB RAM in the form of 30pin SIMMS and also contains a ROM socket for installing newer versions of Kickstart. The switch on the front left of the unit is for turning the hard drive on and off whilst the switch on the front right is for switchting between the ROM on the AT500 and the ROM inside the Amiga. The HD controller, despite being IDE may only be able to accept one device.